Listen up buttercup, you can spend half an hour doing your hair to look just right with your cowboy costume or you can top off your look with this cowboy hat and be ready to go in a few quick seconds. The choice is yours, but we all know that the first option makes you a late and the latter does not. 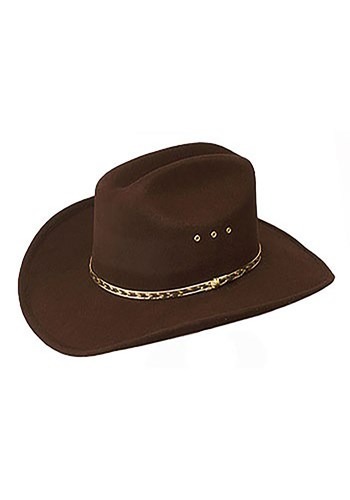 Whether you are looking to ride on a noble steed or in a yellow taxi cab, this Brown Cowboy Hat will perfectly complete your costume. This hat is brown felt, and comes with a golden brown trim around the crown. Also, don’t worry about this hat flying off when you try to ride that bull, because it has an elastic interior for a secure hold that will stay all night long! The hat arrived in its original shape, meaning not folded etc which was nice. Sometimes folded hats don't return to their original shape. Really great option if you need a brown cowboy hat. Can be used for anything.